The magnificent 10oz 2018 Griffin silver coin is the latest addition to the Royal Mint's famous Queen's Beasts Series. It's a must for collectors who want striking coins that retain their beauty and value. It’s also a great choice for investors thanks to its silver content and purity and because it’s part of one of the world's most sought-after bullion coin collections. Artist Jody Clark took his inspiration for the Queen's Beasts bullion coin collections from the mythical creatures that stood watch in the form of golden plaster statues when HM Queen Elizabeth II was crowned at Westminster Abbey in 1953. The Griffin of Edward III is said to signify courage, vigilance, swiftness, guardianship and strength. A gracious and benevolent creature, it was said to have good sight and Edward III chose it for his private seal. Jody Clark has created a beautifully detailed image for the reverse of this amazing coin. The Griffin is depicted with its wings raised and holding a shield that shows Edward III's birthplace, the Round Turret of Windsor Castle. The Royal Standard can be seen flying from the top of the turret which is framed by two oak branches and the royal crown. Why choose the Silver 2018 10oz Queen's Beasts Griffin of Edward III? As well as a new coin from one of the most popular collections on the market today, buyers receive a hefty 10 troy ounces, or 311 grams, of 999.9/1000 pure silver. This exquisite coin has a diameter of 89.15mm, allowing you to fully appreciate the majestic Griffin of Edward III as imagined by Jody Clark. Unusually for a bullion coin, both the obverse and reverse are the work of the same artist. The coin is issued by the British Royal Mint in Llantrisant Wales, and you can expect a product that displays the mint's hallmark quality and attention to detail. 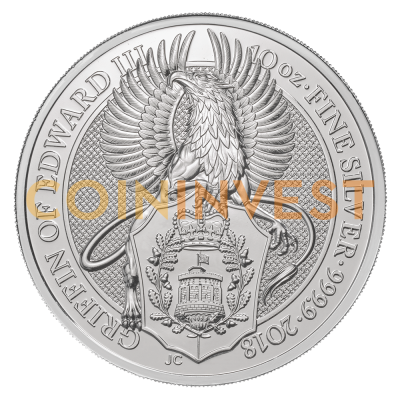 And, of course, like all UK legal tender silver coins, the 2018 10oz Queen's Beasts Griffin is VAT Free and exempt from Capital Gains Tax (CGT).